pioneer Superintendent, Pastor Sunday Thomas Idowu. Pastor Idowu passed away on Sunday, 30th December, 2018 at age 76 after brief illness. CAC NEWS gathered that "Service of Song" will hold on Tuesday February 12, 2019 by 4pm at CAC Somolu Olaleye DCC headquarters. 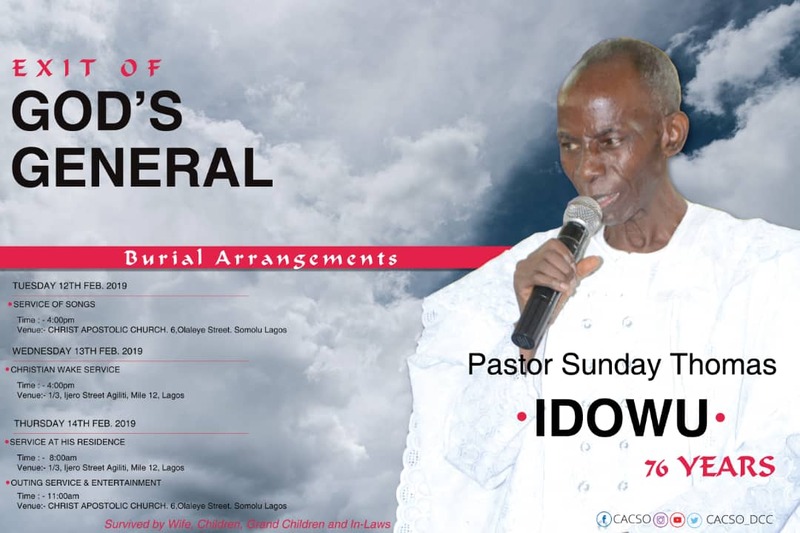 The late Pastor Idowu was born on Sunday, 4th May, 1942 in Offa, Kwara State. He was a committed and faithful Christian all his life. 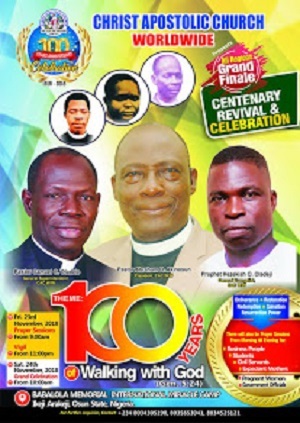 He was appointed an Elder in Christ Apostolic Church, Somolu Olaleye in 1963 and was later ordained as Pastor (with ninety-five others) on the 28th April, 1989. He pastored, headed and saw Somolu Olaleye rose from an assembly to a District in 1996; later, a Zone in 2001 and ultimately to a Districts Coordinating Council in 2017. Aside from being a spiritual father to very many, he was much more a foster father to several others. He was generous to a fault! He did not only spend his resources for the work of God, especially, evangelism and church planting – his core beliefs; he also spent himself for the gospel and humanity. He was a fierce prayer warrior, a passionate evangelist, an encourager of spiritual worship, a believer of divine healing and an advocate of singing of praises to God alone. We also learnt that "Christian Wake Service" will hold on Wednesday February 13, 2019 by 4pm at 1/3, Ijero street, Agiliti, Mile 12 Lagos, while a service will be held on Thursday February 14, at the same venue by 8am. 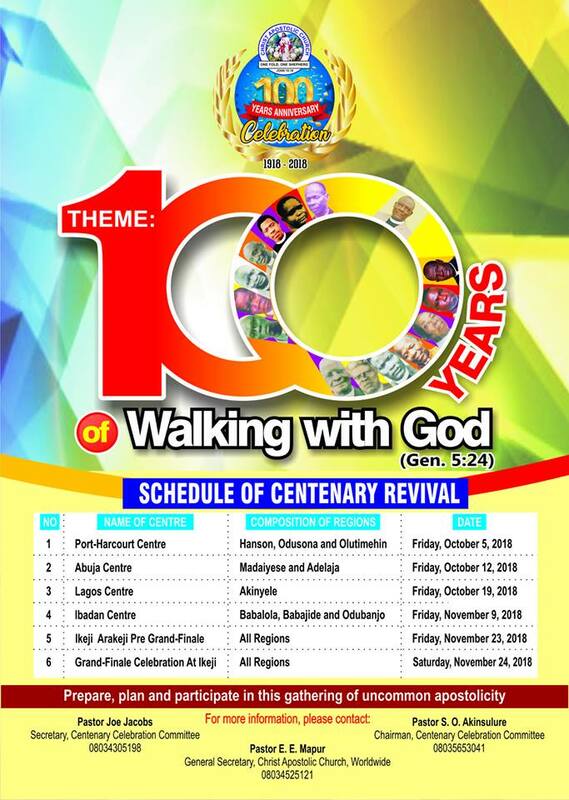 Also, Outing Service and Entertainment will hold on February 14 by 11am at CAC Somolu Olaleye DCC headquarters. A great disciple of Christ who has made his own marks within the Tenets of the word of God. Rest on sir. Those of us behind let's carry the armour of God and continue where he stopped. We still have a lot of work to do in the kingdom. May the Lord God Almighty grant us the power, zeal, wisdom and the spiritual empowerment to do His till the end. A great legacy papa Idowu has left behind thank God for a life well spent for God. up to the bountiful giver of life,the dear ones are gathering home.goodnight,my father in the Lord.U gave me net for fishing,in 1982 at NEPA.u supported me,during my marriage ceremony.ur spiritual life worth being emulated.Rest on God's general,at the bosom of our saviour,till resurrection day.Evg.Mrs Omoniyi Funke,née Ogundele.lb.